For those who might not know, “crofting” is the word used for the form of agriculture still carried on in the west Highlands. Oddly, the Gaelic word “croitear” which is now used for crofter and has been for more than 100 years, actually means “hunch back” According to Dwelly, the word also means a hillock, or a small piece of arable land, although he also gives “hunch back” and some people think that this application of the word to a crofter is because they were always bent double over their tatties!! 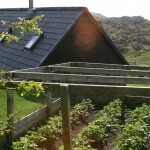 Basically, a crofter is someone who owns or rents a piece of land on which he grows things, keeps stock and has a right to run the stock on the common grazings which still exist here, although in England most of the common land disappeared in the 18th century when the Enclosures Act was passed. 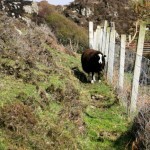 A crofter also has a right to a strip of land to cut peat. 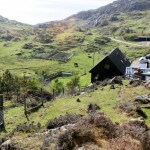 This is how I understand things anyway – Crofting Law is a minefield and certainly beyond my limited knowledge! 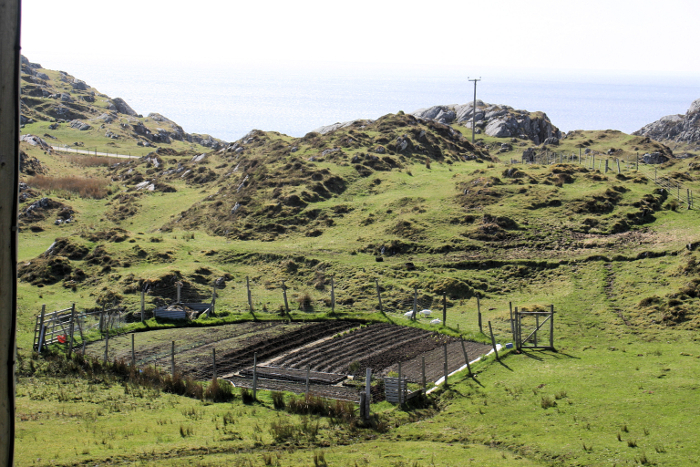 Modern day crofting is not as it used to be. There is no doubt that a person could no longer keep themselves, never mind bring up a family, relying just on a croft; they have to have another source of income one way or another. At the same time, I certainly don’t think the term “hobby farmers” could be applied to them either! Most of them are very hard-working and take the job seriously, at what ever level suits them and their families. However, no grain of any sort is now grown on a croft, although the remains of the “runrig” system of cultivation of the oats, barley and potatoes which were the staple crops for the last almost 200 years, are to be clearly seen in places. I had better quickly say here that oats and barley have been cultivated probably since farming first arrived here back in pre-history, but potatoes are a recent arrival. Keeping cattle has always been the tradition up here and there are still a number of folds of Highland Cattle in the area, either pure bred or crosses. Quite a number of crofts have horses on them again (the new doctor has brought 29 rescue horses with her!) and the keeping of pigs, although not traditional to the area, is becoming quite popular. For one thing, pigs have the useful ability to clear bracken from the land! A lot of people who have a croft just keep a few sheep, most of which are the North Country Cheviot breed which fare better in our milder coastal climate than the Blackfaces which are more common on the Western Isles and further inland where the winters are more severe. Numbers of rare breed sheep, especially the wee black Hebridean breed with their multiple horns, are on the rise round here. 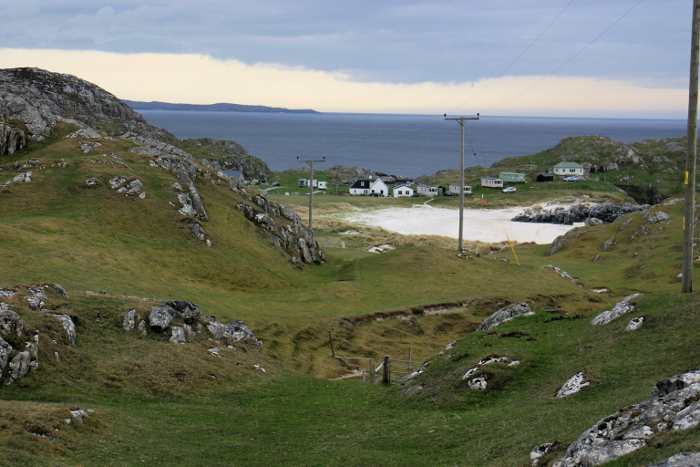 Anne and Bob Cook in Clachtoll have one of the very few flocks of Boreray sheep kept on mainland Britain; my friend, Claire, who has a croft in Stoer, keeps the wee, colourful Shetland breed and Bridie in Elphin has Soays along with Shetlands. There is plenty of local choice of wool for us spinners! The Dutch breed, Zwartbles, is becoming increasingly popular. You see quite a number of these smart, black sheep with a white blaze down their faces and four white feet on the east side of the country, and now here too. 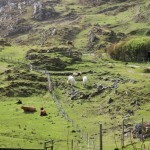 These are the sheep which Anna and her husband, Ray, chose to use for milk. When I first got to know Anna and Ray soon after we moved here, they had a Jersey cow which they milked and which gave the most fantastic, creamy milk. But now after several years without their own supply, they looked to sheep instead of another milking cow. I think they must have had very good reasons for this choice! Here I will break for a moment of science. I think that most people know that goats’ or sheep’s milk is better for you than cows’ and the reason for this is that they differ at the molecular level. Goats’ and sheep’s milk has smaller molecules which makes the milk easier to digest for humans. There is a school of thought which says that we, as humans, are the only creatures to continue to take milk when all other mammals don’t after a certain age. Well, in my experience, that is not quite true!! A goatling for instance will continue to suckle, given half a chance, until she has a kid herself, however many years that may be. Human females can lactate for 30 or more years – wet nursing was a profession in the past, not just the haphazard hope that “a woman in the village had just had a baby” approach that modern film makers would have us believe. The domestication of animals goes back to the end of the last ice age, and although it takes time for adaptations to take place, we have almost certainly been partaking of milk for a good chunk of the last 10,000 years in one form or another. Anyway I am getting a bit off-track here! Anna and I chose the end of May for my visit and I duly turned up on a lovely day, which was just right for taking pictures. Anna and Ray have quite a big area of land to run, and they have cows, horses and various varieties of poultry as well as sheep. 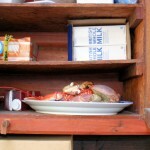 They grow a lot of vegetables, some of which help feed the animals as well as themselves, and some they sell. Anna is also an assistant teacher at Stoer school and Ray has recently retired from training people in India to become teachers – for which services he was recently recognised by receiving an MBE. They are very busy people, and so for some years, they have had the physical help of WOOFERs – World Wide Opportunities for Organic Farming. These people come to help on the croft from all parts of the world, and live in what was the original house which has been converted into a delightful place to stay. We had a cuppa when I arrived, and then Anna went to seed in a few lettuces while I wandered round taking pics and talking to their male Zwartbles, Dobbin. Coming up to 6.30, the females appeared and we got ready for the milking. Their system is that the lambs have their mother’s milk until about 2.00 in the afternoon, when they get shut up until after milking. These are very milky sheep providing enough for their lambs to be huge, strong and healthy (but unfortunately both male!) with enough left over “for the house”, and Anna was looking forward to the lambs going to market so that she can have enough milk to make cheese. 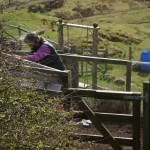 I did find the experience quite different in many ways from milking my goats! For one thing I always milked into a bucket, which isn’t very possible with sheep because their teats tend to stick out sideways, and of course are much smaller. They do, however, have the same ability to hold their milk back when they detect a strange hand on the udder! I managed to milk some out into the bowl which was held in my left hand under the teat, while Anna milked the other side in similar fashion. When the bowls had a certain amount in, it was wise to tip the milk out into a jar to save any chance of spillage. To my chagrin, Anna had to help to get the milk out – after so many years of milking I thought I would have done better, even though both Anna and Ray assured me that I had achieved more milk than anyone else who had tried:-) While all this was going on at one end, the sheep was busy eating its cake at the other, and when the trough had been licked clean, she was let out and replaced by the second one. 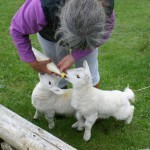 When both had been done, they were let in with their lambs who had also received a supplementary feed – everybody happy! 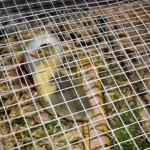 This entry was posted in Animals, Local area and tagged Achmelvic visit. Bookmark the permalink.